Dz is a digraph of the Latin script, consisting of the consonants D and Z. It may represent /d͡z/, /t͡s/, or /z/, depending on the language. Dz generally represents /d͡z/ in Latin alphabets, including Hungarian, Kashubian, Latvian, Lithuanian, Polish, and Slovak. However, in Dene Suline (Chipewyan) and Cantonese Pinyin it represents /t͡s/, and in Vietnamese it is a pronunciation respelling of the letter D to represent /z/. Some Esperanto grammars, notably Plena Analiza Gramatiko de Esperanto, consider dz to be a digraph for the voiced affricate [d͡z], as in "edzo" "husband". The case for this is "rather weak". Most Esperantists, including Esperantist linguists (Janton, Wells), reject it. ⟨Dz⟩ is the seventh letter of the Hungarian alphabet. It is called dzé (IPA: [d͡zeː]) as a letter of the alphabet, where it represents the voiced alveolar affricate phoneme /dz/. dz generally represents [d͡z]. However, when followed by i it is palatalized to [d͡ʑ]. 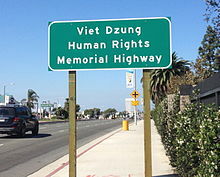 Dz is sometimes used in Vietnamese names as a pronunciation respelling of the letter D. Several common Vietnamese given names start with the letter D, including Dũng, Dụng, and Dương. Whereas D is pronounced as some sort of dental or alveolar stop in most Latin alphabets, an unadorned D in the Vietnamese alphabet represents either /z/ (Hanoian) or /j/ (Saigonese), while the letter Đ represents a voiced alveolar implosive (/ɗ/) or, according to Thompson (1959), a preglottalized voiced alveolar stop (/ʔd/). Z is not included in the Vietnamese alphabet as a letter in its own right. Many Vietnamese cultural figures spell their family names, pen names, or stage names with Dz instead of D, emphasizing the Hanoian pronunciation. Examples include the songwriter Dzoãn Mẫn, the poet Hồ Dzếnh, and the television chef Nguyễn Dzoãn Cẩm Vân. Other examples include Bùi Dzinh and Trương Đình Dzu. ꭦ, a ligature of lowercase dz with retroflex hook, used in Sinological and Tibetanist transcription for a voiced retroflex affricate, is encoded at U+AB66. ^ Thompson, Laurence (1959). "Saigon phonemics". Language. Linguistic Society of America. 35 (3): 458–461. doi:10.2307/411232. JSTOR 411232. This page was last edited on 8 March 2019, at 03:01 (UTC).